Openbox is one of the most popular lightweight window managers. Unfortunately, it is not very newbie friendly. It is true that there are some very good tutorials for customizing a desktop based on the Openbox but most newbies want to install something that is easy to use and offers everything one needs out of the box. This is exactly what LXDE does. It is used by several lightweight distributions, including Ubuntulite and VectorLinux lite. Soon it will be on even more desktops, as also gOS has adopted the desktop to be used in the cheap NetBooks and NetTops for sale in US and elsewhere. Not everyone on this earth is rich. There must be a nice desktop environment for those who can't afford new fancy hardware, and we have the ability to help them. If Windows 98 and xp work quite well on old machines, why my Linux desktop needs a 1.0 GHz CPU + 1GB RAM? We don't believe building such a usable desktop environment requires that much resource usage, so we try it ourselves. Because reinventing the wheel is cool, and we love it! 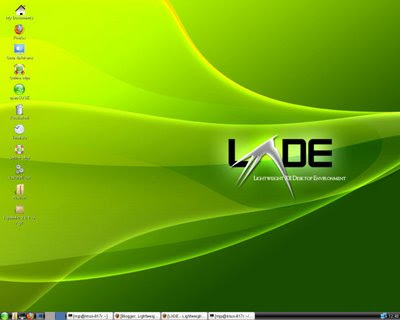 LXDE combines several lightweight software together to produce a nice desktop. It includes a panel with taskbar and start buttons, a wallpaper, a file manager that provides also desktop icons, a session manager, an image viewer, a lightweight text editor, a terminal emulater and a file archiver. 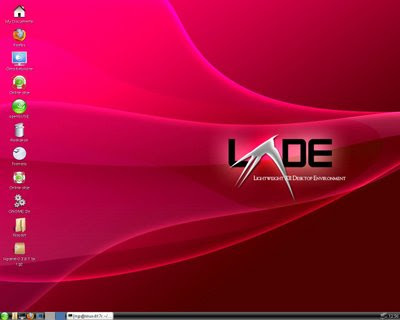 Some of the components are part of the LXDE project, some of them are delevoped independently and suggested by LXDE developers to be used as default applications for LXDE. Hardware requirements for LXDE are moderate. The developers suggest using at least a Pentium II class CPU. LXDE and X themselves require only 45 MB but the user should have some memory left for other applications. For using applications like OpenOffice.org and Firefox, they suggest having more than 128 MB RAM. I would, however, suggest using lighter alternatives for those memory-hungry applications. Anyway, LXDE should run fine on any computer built in this decade. It is based on gtk+2 which is not the lightest possible toolkit. On the other hand, it offers everything needed for internationalized user interface including writing from right to left. This may not be important for users preferring English, but for the rest of the world it is an important and thoughtful decision. In fact, before writing this review I decided to help in translating parts of the user interface to the language I prefer to use on my desktop. LXDE is packaged for most of the popular distributions even if in some cases the packages must be downloaded from community repositories. In my case, the installation for openSUSE was painless and everything worked well. The desktop loads almost instantly unlike GNOME or KDE and it is nicely put together. 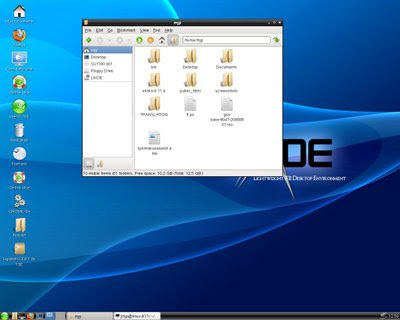 LXDE functions just like new users expect a desktop environment to function. Thus, right clicking the root window opens a menu letting the user sort the icons, create new folders and text files (but not start buttons) and change desktop settings including the size of icons and choose the wallpaper from three different wallpapers branded for LXDE. In my opinion, LXDE is the best lightweight solution for newbies not interested in searching the right combination of lightweight applications to produce a nice user experience nor configuring window managers and panels by editing text files. LXDE might be the right one even for more experienced users as it gives everything one needs. But those users seeking a desktop for hardware build before 1999 should try something else. Wow I wasn't even aware of this one till I read your blog. very nice looking desktop. Imma have to try this one on the old Pentium II systems that we were going to use DSL or feather on!